Ready to revise? Use Roy Peter Clark’s 50 Writing Tools: Quick List to excise the bloat from your prose. The quick list comes from Writing Tools by Roy Peter Clark. Self-editing is a skill that any writer can benefit from, though sometimes as writers, we don’t know what we don’t know. In other words, we struggle with precisely what to focus on to improve our writing. In times like these, we can use Roy Peter Clark’s 50 Writing Tools: Quick List as a starting point and a checklist to help us shape and hone our prose. 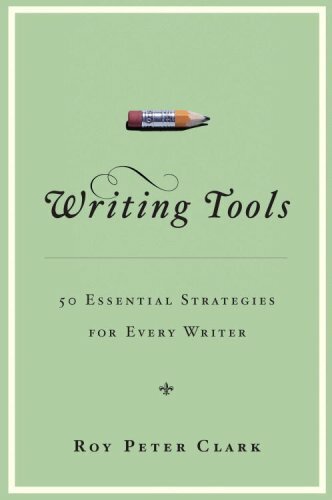 Based on Clark’s book, Writing Tools: 50 Essential Strategies for Every Writer , each tip is designed to improve either your writing or your writerly workflow. No. 2: Order words for emphasis. Place strong words at the beginning and at the end. No. 7: Fear not the long sentence. Take the reader on a journey of language and meaning. No. 26: Use dialogue as a form of action. Dialogue advances narrative; quotes delay it. No. 29: Foreshadow dramatic events or powerful conclusions. Plant important clues early. Interested in how others self-edit? Check out out recent self-editing roundtable. Writing Tools also offers a nifty companion podcast for your listening pleasure. Each of the 50 tools has a short (two-three minute) podcast that shares more detail on each tip and how to apply it to your writing. Which are your favorites from Clark’s list? Which of your favorite tips would you add to this list? Let us know in the comments. I bought this book when I started blogging and I cannot tell you how helpful and valuable it has been to me. I give it two thumbs up. 37. In short pieces of writing, don’t waste a syllable. Shape shorter works with wit and polish. Write from the heart. Let the reader feel. There is nothing more unforgettable than a heartfelt narrative. I like #40 Draft a mission statement for your work. To sharpen your learning, write about your writing. I try to define “the take away” in advance. What is the benefit to the reader if there is no “walk away value”? Had the opportunity to hear him speak at the St. Petersburg Times Festival of Reading when this came out. A signed copy is on my shelf. Easily one of the most useful books on writing that I have. Fear not the long sentence. Take the reader on a journey of language and meaning. ‘Fear not the long sentence’ is a good one. It can be tempting to try and write in punchy, snappy style, but as long as your grammar is half decent a long and winding sentence can mix up the flow nicely. Also like the point about dialogue, which can add real warmth and character to a piece. #7 Fear not the long sentence. Take the reader on a journey of language and meaning. And #23 Tune your voice. Read your drafts aloud. These two tend to go together as the best way to tell if your sentence is too long is to read it aloud. Did you lose the message by the time you finished reading? If not then it is good to go! very stimulating and heartfelt book having impressive style and diction. This is great. Utilizing many of these points would add so much to creativity. Thanks for pointing us toward the list. I love #14. Get the name of the dog. A handy-dandy little guide for ‘butterfinger’ moments when I dumbly prod at keys in the hope that something coherent will appear on my computer screen. “Fear not the long sentence,” is quite the eye-opener for me as there are times–it comes and goes like all the seasons in my mind–where I get intimidated by the idea of prose, and as a novice writer attempting their first novel, this book is something I could… I mean, I will most definitely be checking out in the near future. Thank you. Oh I do like No. 7. Sometimes I just can’t help but write ridiculously long sentences. Nice to know it has a seal of approval in at least some circles! Finding the E-version already! Anybody got a link??? Here’s a link to the book on Amazon.com. #26 is a good point, one I need to keep in mind more often! 41. Turn procrastination into rehearsal. Plan and write it first in your head. I’m totally getting this! Sounds like there are tons of awesome writing tips! I have this, looking forwards to reading it now! I think my favorite would have to be #40 “Draft a mission statement for your work. To sharpen your learning, write about your writing.” Great piece of advice and I plan to use it immediately! Added the book to my must reads list and plan to check out the podcast too, thanks! I read this book. It is worth the read. I bought this book years ago and reread it often. Excellent book to give both a novice and long time writer.